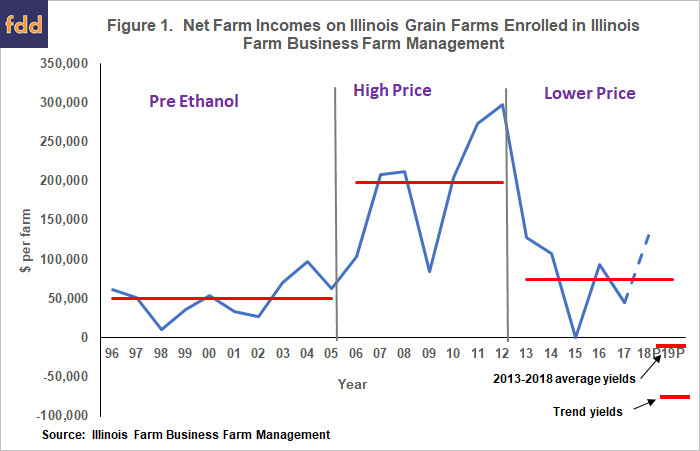 Grain Farm Income Outlook for 2019-Negative Incomes Ahead? Illinois Farm Business Farm Management (FBFM) from 1996 to 2017.
bushels set in 2016. These high yields will increase 2018 incomes (farmdoc daily, September 5, 2018). bushel rates at $1.65 for soybeans, $.14 for wheat, and $.01 for corn. 30% of expected production to be priced at higher prices (see farmdoc daily, May 15, 2018, for a discussion or pre-harvest hedging related to corn). As always, incomes will vary across farms because of yield variability. grain that was priced before May will impact returns across farms. increase in 2019, led primarily by fertilizer price increases (see farmdoc daily, September 25, 2018). appears to have ended (farmdoc daily, June 21, 2018). using a $3.60 per bushel corn price and $8.50 per bushel soybean price. at 1) trend yields and 2) above-average yields. (see farmdoc daily, December 11, 2018, and January 3, 2019). These higher yields raised incomes in recent years. A return to trend yields would result in lower profits. occurring in the 1980s during the height of the farm financial crisis. erosion of financial position would occur on most farms. (see farmdoc daily, January 14, 2019). Administration has stated that MFP payments will not continue in 2019.